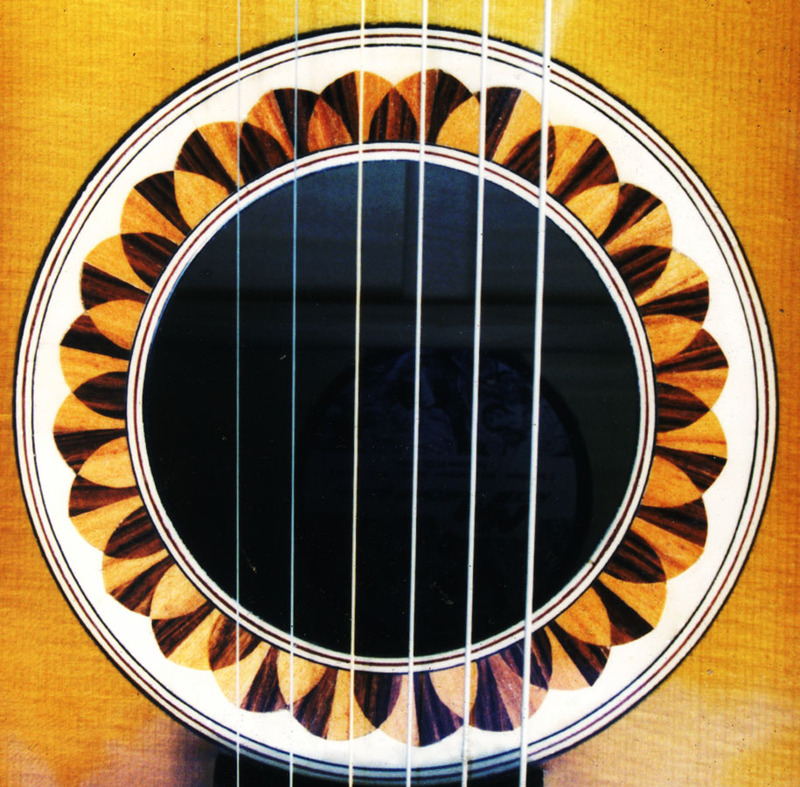 A complete instructional guide as to how I make a wood veneer sound hole surround (rosette) - although this guide is for a particular soundhole design the techniques described could be adapted to other soundhole surround designs. Lots of pictures so I have divided this tutorial into four parts to enable fairly quick page loads. I will take you through all the steps to end up with a design in wood similar to the picture above. 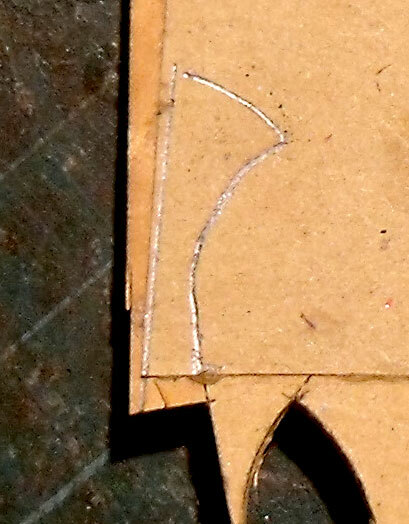 A 2 pence coin - this is the actual cutting guide. All the curved lines are cut using this. One is cut from sheet aluminium and has the design of the 4 finished parts - these are for drawing round prior to cutting the veneer. The other is made from perspex and is a 15 degree segment of a circle - this is for drawing the cutting lines on segments. The fact that you can see through it makes it easy to visually align. 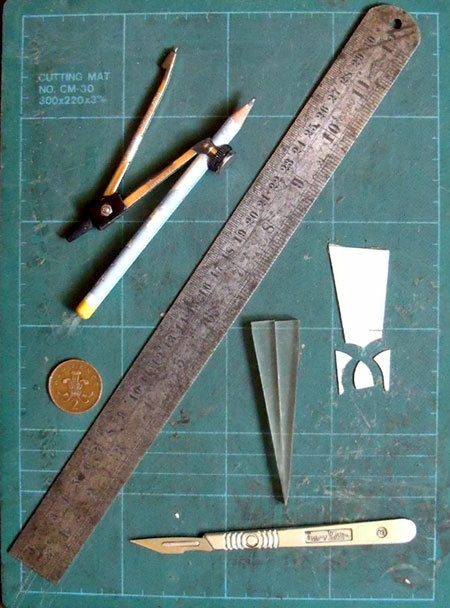 Make your own template simply - using compasses, protractor,ruler and 2p coin. These are the main tools needed for the project - a few more tools will be used. These should contrast to a certain degree but it is not necessary that they should be completely different from each other in tone. 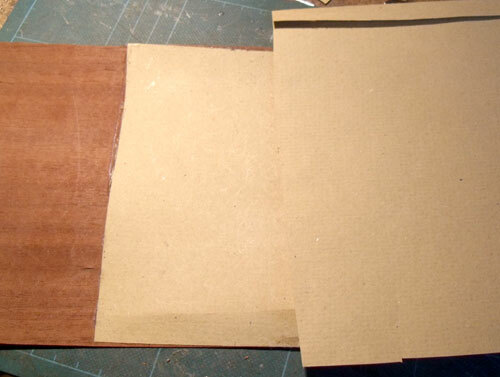 bottom right is what I will be using for all the "crowns"
Glue some strong paper to one side of the veneer. 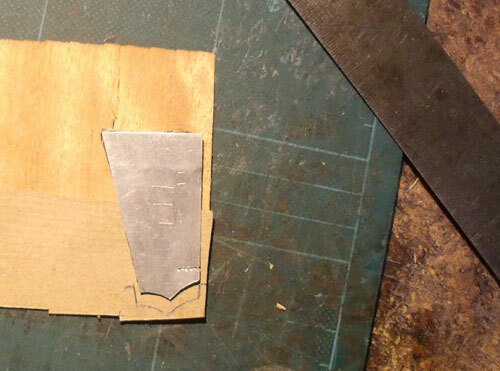 This is not essential but it really helps to keep the small shapes intact when you are cutting them. 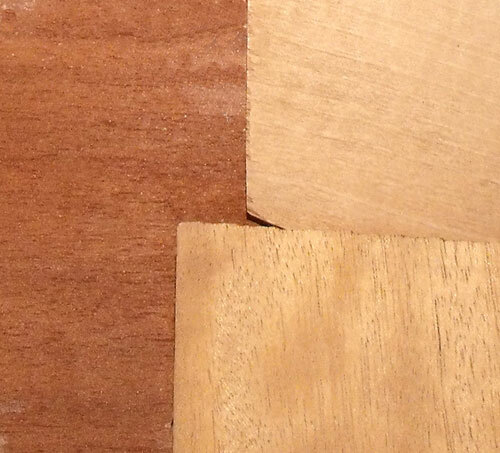 Some woods are very easily split along the grain and so chunks can easily come off corners. I am using a large old manila envelope for the paper. 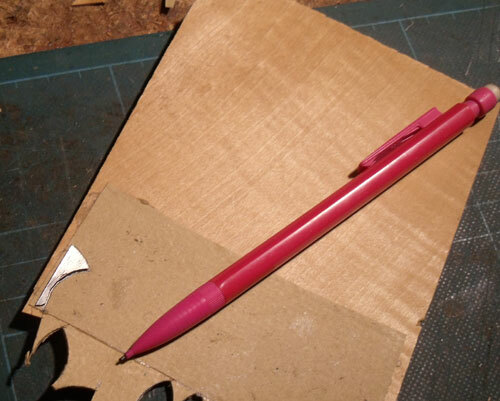 The glue I use for this and for all the gluing in this project is "Titebond" aliphatic wood glue. 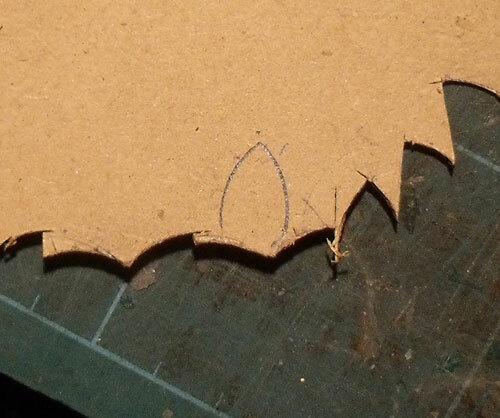 It is best to draw on the side that is papered as this makes the lines easier to see. 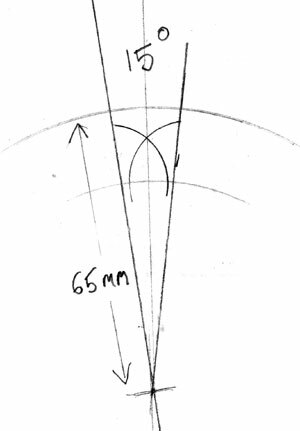 Because the design is circular grain direction is not critical but does need to be consistent. 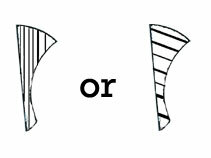 pieces have the same grain direction. Position the 2p coin carefully covering about half of the width of the pencil mark you have drawn so you can only just see a trace of the line under the edge of the coin. 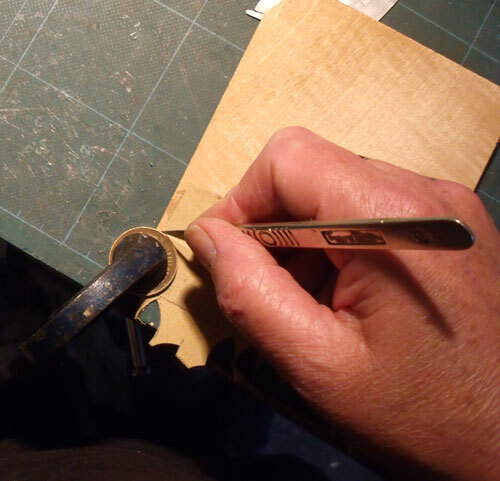 I then use a small clamp to hold coin and veneer firmly in place. 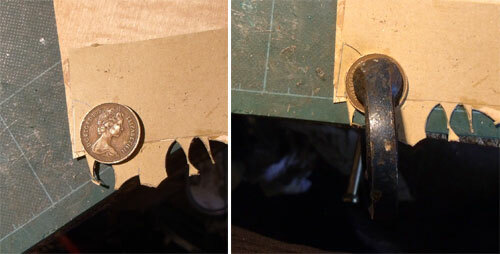 This is not essential as you could just hold the coin but I find clamping makes it easier to concentrate on cutting. You should push into the side of the coin with the blade and avoid too much downward pressure to start with. 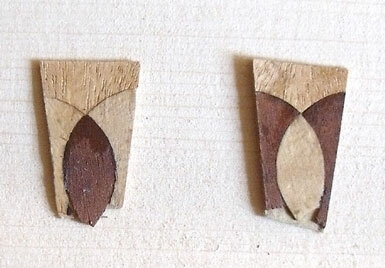 You may have to make 5 or 6 passes to cut right through - depending on the hardness of the veneer. 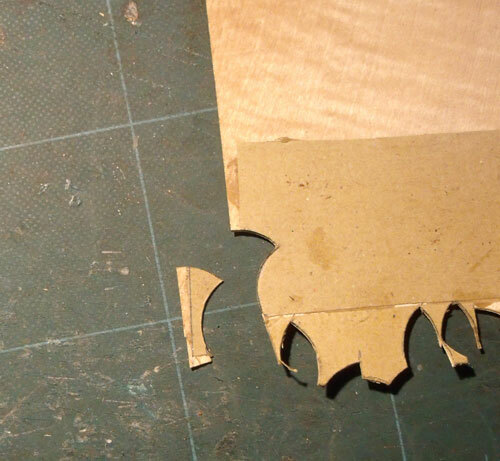 Bear in mind that the curves are the only cuts that are important at this stage - the sides and bottom will be trimmed later in the process and merely have to be large enough. We need 12 dark and 12 light of these.